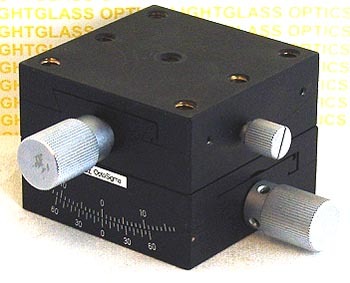 The 123-2895 two-axis goniometric stage from OptoSigma is, in my opinion, the best goniometric stage on the market. Made of Brass and Steel, its movement is smooth and precise. The stage is 65mm square and is 48mm tall. Each axis has a locking screw. The top is drilled and tapped for M6 metric screws.